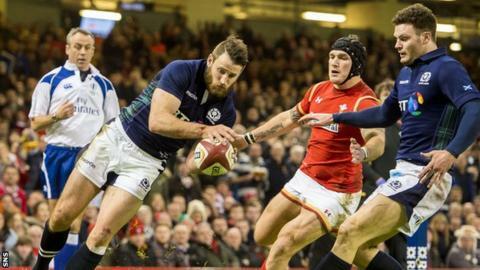 Scotland wing Tommy Seymour has his foot in a protective boot after suffering a sprained ankle in Saturday's Six Nations defeat by Wales. The Glasgow player will require ongoing care and assessment before the Scots' next game against Italy on 27 February. Lock Richie Gray also sustained a sprained ankle but has had his boot removed and will return to Castres. Flanker Blair Cowan was concussed late on but Stuart Hogg's back injury "is not considered an immediate concern". Full-back Hogg was forced off after 28 minutes in Cardiff, with Ruaridh Jackson coming on in his place. Cowan, who replaced John Barclay for the final 15 minutes, will be subject to the "graduated return to play protocols" at his club London Irish in the 'fallow' week before the Six Nations resumes. Cowan's club-mate Sean Maitland will have further treatment and assessment with the Exiles after being forced to withdraw from the Scotland line-up on the morning of the match with an injured thigh. The outstanding Seymour scored Scotland's first try in Cardiff as Vern Cotter's side suffered their second straight defeat of this year's championship, and a ninth in a row in the tournament since beating Italy in Rome two years ago.